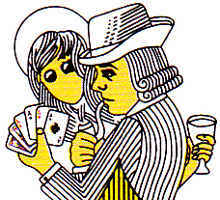 A rare occurrence with the court figures is that the court figures of the diamond suit in a normal deck now belong to the suit of hearts, and vice- versa. 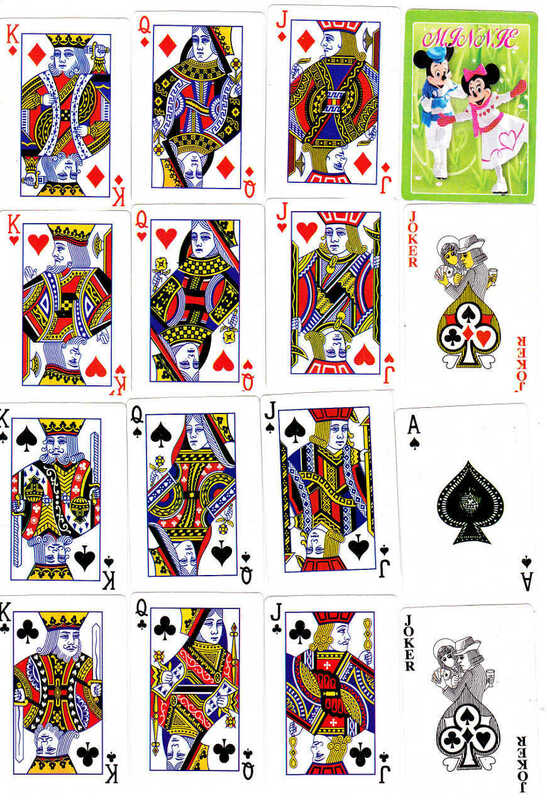 The same occurs with the spades and clubs. The backs show images of Mickey & Minnie mouse dancing together, (but there is no indication of any acknowledgement to Walt Disney). Neither the box, Jokers nor the Ace of Spades have any manufacturer's name upon them, but the manufacturer is most probably from China. There appears to be another version of this deck, albeit with different cartoon characters and a red back. This pack seems to be a rarity, for I have not seen it outside a single shop in Chinatown. Images and descriptive notes kindly supplied by Anthony Lee. Above: Minnie Patience pack from Singapore (but manufactured in China). 52 cards + 2 Jokers in tuck box. Image kindly supplied by Anthony Lee. It is fairly common to mix up court figures, all of them or just a couple. Mesmaekers mixed up the QC and QD in the late 19th century, and even Carta Mundi in the 1970s mixed up the red queens in their wide-size packs - and then unmixed them. Due to a lack of knowledge of the tradition of English cards this can occur anywhere.